This past summer ecoartspace sponsored artist Simon Draper and his Habitat for Artists Project at Spire Studios in Beacon, NY. Several artists living in the Hudson Valley were invited by Draper to participate in this site-specific, collaborative exhibition project. Draper, who has long been working with concepts regarding habitat/shelter in his own art provided each artist with a basic 6ft. by 6ft. shed, to be used as a workspace for the duration of the show, which closed in November. 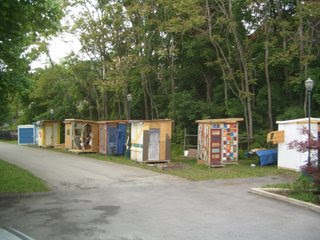 Ecoartspace’s relationship with Draper evolved from summer 2006, when Amy curated an outdoor exhibition at Abington Art Center’s Sculpture Park in Philadelphia titled Habitat in which Draper participated with his shed “Private Reserve”. This work remains on view and acts as a shelter and contemplative space for the viewer. For Draper, the work also functions as a metaphor for his personal art making activity and provokes larger questions regarding marginal spaces, artists as pioneers in developing neighborhoods and communities and the ongoing migration of artists from these places they helped to nurture and create. In this new project, Habitat for Artists, the sheds literally functioned as temporary studio spaces. The question becomes, in a time of escalating prices for artist’s workspace and as artists flee Manhattan and Brooklyn in search of more affordable workspace such as in the Hudson Valley region - how much space does an artist need to create their work? Each artist involved in the project adapted their shed to suit their own needs. The sheds came outfitted with simple openings, doors, windows and skylight. As much as possible, the materials used in the creation of the structures consisted of reclaimed and re-used components. 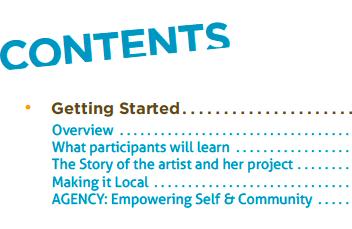 Artists included in the HFA project were Chris Albert, Richard Bruce, Sharon Butler, Kathy Feighery, Marnie Hillsley, Matthew Kinney, Sara Mussen, Steven Rossi, Dar Williams, Grace Knowlton, Matthew Slaats and Simon Draper. Welsh-born artist Simon Draper has lived and worked in the US since attending Cooper Union in the 80’s. He moved to the Hudson Valley in 1996, where his work has become focused on the humble architecture of the lean-to shed. An endlessly adaptable form, Draper has applied his ingenuity in fashioning them out of surplus and discarded materials—at times, including his own previous work. On Sept. 9, HFA artist Dar Williams' held a CD release party for her new recording, Promised Land at Spire Studios in Beacon as a fundraiser for several regional non-profits represented at the event including Ecoartspace, Scenic Hudson, The Beacon Institute, Hiddenbrooke, Clara Lou Gould Fund for the Arts, Hudson River Healthcare, Farmworkers Fund and Flying Swine Live Theater. The artwork in the new Promised Land CD booklet was on display for the event, which includes the HFA artists as well as Maureen Beck, Val Clark, Aidan Draper and Grey Zeien. Before singing a few new songs, Dar spoke about the collaborative effort that brought this project together. John Cronin of the Beacon Institute and Erin Riley of Scenic Hudson also spoke about the environmental work their organizations are doing in the Hudson Valley.